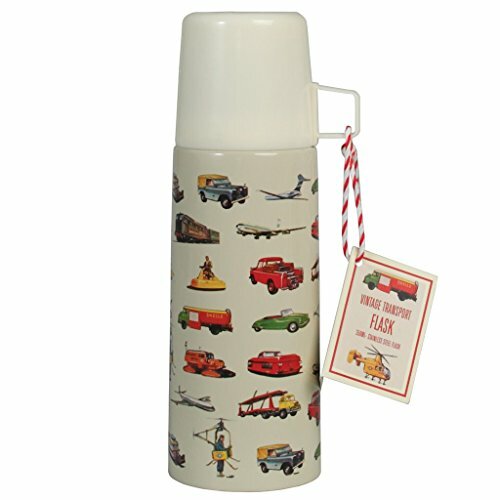 This insulated flask in the Vintage Transport design can keep your drinks hot or cool on the go. Take it on your commute, as part of your packed lunch, or on picnics or days out. It has a plastic lid which also functions as a travel mug, and a push top opening which allows drinks to be poured without having to unscrew the whole lid. Much more exciting than your average thermal flask, this makes a great gift for any car, plane, boat or train enthusiasts. Care Instructions: In the interest of safety and hygiene please ensure that your flask is cleaned with warm water and washing-up liquid prior to initial use. For best results from your flask, before use pre-fill for about 3 minutes using either hot water for hot drinks or cold water for chilled drinks. Never use a microwave or conventional oven to pre-hear your flask. If your flask has not been used for some time, rinse with warm water to remove any residual odours. Do not overfull your flask. Leave sufficient space in the neck to fit the stopper. After filling, always ensure that both the outside cup and stopper are tightly closed. Cleaning: Use warm water and washing-up liquid to clean your flask after use. Rinse thoroughly with hot water. Do not immerse in water. Dry thoroughly after leaving it to drain. Store with the stopper off. Do not put your flask in the dishwasher. To remove difficult stains, fill your flask with hot water and add one teaspoon of bicarbonate of soda. Do not put stopper on product while using this cleaning method. Soaking overnight produces excellent results. Always rinse before re-use. Caution: Avoid abrasives, solvents and bleach products. This product must not be used for keeping milk products or baby food warm or cool, to avoid the possibility of bacterial growth. To prevent scalding always pour contents into a cup. Do not drink directly from the flask. Keep out of reach of children when product contains hot liquids.